As an artist the quality of the material that inspires you is so important. In other words, providing your brain with a good quality and quantity of mental input will help your creative output immensley. Let's think about this in a more concrete way: if you wanted to create an art project or series based on greasy-spoon diners you'd probably be best suited to find the greasiest diner in the neighbourhood and go take photos. You could hang out there and observe the patrons and staff throughout their daily routines and take a few notes. You might consider watching some films or tv shows that feature a diner as a main setting for their story (Twin Peaks). Suddenly television becomes less of a passive experience as you consider what you could watch that would have some effect on your ability to create great work. You are looking for something that is rich in the take-away value that is particular to the project you have in mind. No watered-down substitute will do! In Austin Kleon's book How to Steal Like an Artist he talks about taking an active role in what inspirations you choose and how to use it in your own work. 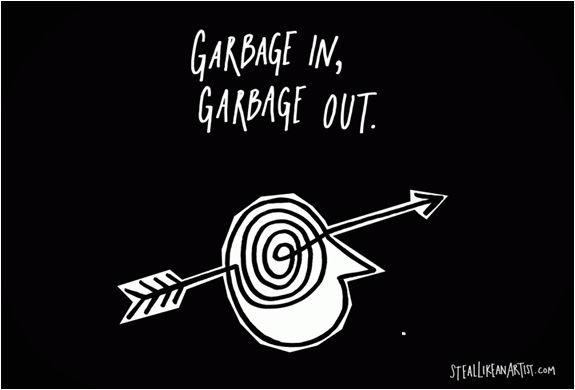 He uses the term garbage in garbage out to suggest that if you feed yourself crummy inspiration don't be surprised at the lackluster results. The input you choose is obviously different for each project but it should still be the best version of that input that you can get your hands on. This could mean that you spend a week reading personal ads in the newspaper for one project or have a brief stint of birdwatching for another. No matter what it is, saturate your brain with stimuli and see what interesting artwork emerges!